On Wednesday 15th June, the final session in soundLINCS’ series of three training workshops in partnership with the Child Learning and Development Advisory Centre (CLADAC) took place. The first two sessions, ‘Build a Brain – Early Years’ and ‘The Teenage Brain’, focused on the development of the human brain in both young children and teenagers, with an emphasis on how these age groups can be supported during these important stages of their lives. The content of the final session, ‘Impact on Arts and Creativity’, shifted more towards the workforce development of those working within the Arts and discussed ways in which the neuro-science of creative practice can be implemented in their daily roles supporting Children and Young People (C&YP). Once again led by Jo Stockdale of CLADAC, delegates attending included soundLINCS Core Staff and Music Facilitators as well as frontline, supervisory and management staff from Lincolnshire County Council’s Children’s Services Department. The session began with a group-based game whereby each delegate was assigned a number. A steady pulse was established through clapping and a number was called on every beat. The game had a call-and-response element with each delegate having to recognise their number, say their number on the next beat and then choose a different number to call on the beat after that. We were shown ways in which the game could be made more challenging once the group became comfortable with it and these added features really got us thinking. Similar to the interactive elements in previous sessions, Jo described what was happening to our brains during this activity and explained the benefits on a cognitive level. The instantly-recognisable steady pulse helped our brains to focus, the cohesion in the group and the resulting laughter helped to neutralise our states of mind, and the call-and-response required attentive listening followed by action which increased awareness. We were then invited to openly discuss what we felt was meant by a ‘therapeutic outcome’ and how that may differ from what we perceive to be ‘therapy’. The variety of professional backgrounds in the room provided a wide range of views, although the general consensus was that these therapeutic outcomes should always result in some form of improvement. The group felt that they differ largely from therapy in the sense that the outcomes can be facilitated by practitioners who are not necessarily therapists. Considering these therapeutic outcomes within the context of the delegates’ roles provided much insight into the expertise of those present and enabled us to discover how many beneficial activities are already implemented on a daily basis. For many of the delegates, the reassurance that their common practice is beneficial for C&YP on a cognitive development level provided them with the confidence to share those methods of good practice with their colleagues and wider organisations. After a brief introduction to the structure of the human brain for the benefit of delegates who had not attended previous sessions in the series, Jo elaborated on the primitive brain and the seven Emotional Systems present in all of us – curiosity, play, sexuality, nurture, anger, fear and anxiety – as documented by the neuroscientist, Jaak Panksepp, together with Dan Hughes’ PACE method of practice for working with infants and young children. Playfulness, Acceptance, Curiosity and Empathy ‘provides a way of thinking, feeling, communicating and behaving that aims to make a child feel safe’. The interesting similarities between the research of Dan Hughes and Jaak Panksepp facilitated discussions on the importance of play and creativity within the roles of Children’s Services and Community Music. It was agreed by all delegates that they could immediately implement the knowledge and discoveries they had learned to help shape their daily practice. Further interactive exercises, involved finding particular shapes present in the room and identifying sounds both inside and outside the building. The aim of these exercises was to increase mindfulness while activating the system responsible for curiosity. 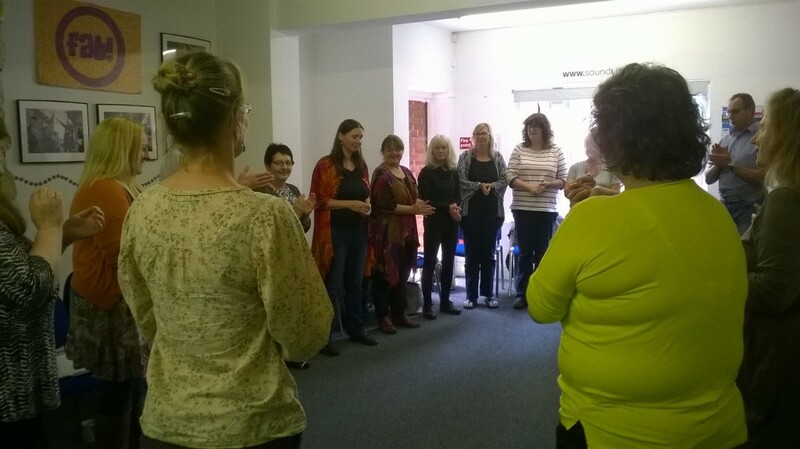 It proved to be very relaxing and the delegates could immediately see the benefit of using this type of activity when working with a large group of participants, particularly one which could be difficult to control. This was followed by ‘entrainment’ and how our state of mind innately affects other people due to the electromagnetic fields produced by our brain and heart. In a working environment, practitioners who are calm and focused will spread that state of mind to the rest of the group, whereas those who begin their sessions stressed will find it much more difficult to engage their participants. To conclude, the group were asked to consider those elements of the day’s session that resonated most strongly with them which opened up a discussion that encouraged delegates to revisit what they had learned and how they felt the information would best be used when returning to work. The differences that arose between each delegate’s views meant that the majority of the content was revisited and explored in a valuable and insightful way. 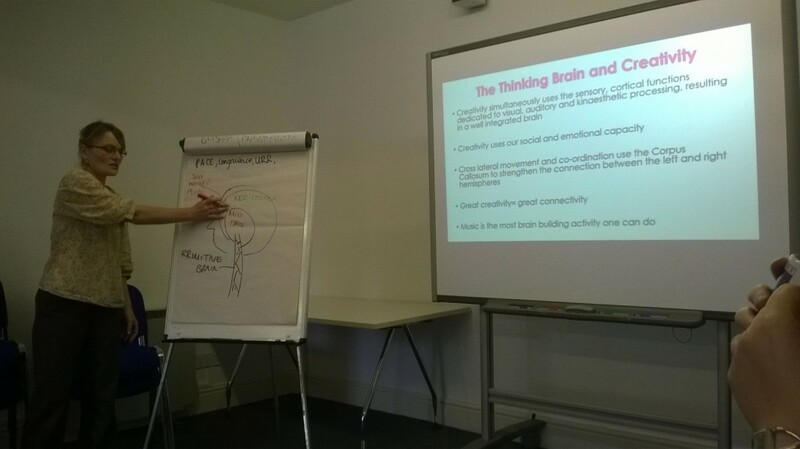 The broad range of perspectives provided by the delegates allowed for engaging discussions throughout the day and enabled organisations to share their experiences, methods of practice and views on neuroscience within the context of creativity. Having delegates from soundLINCS and Lincolnshire County Council’s Children’s Services Department present for the session meant that Jo was able to tailor the content once again to ensure all of the information was relevant to the group and the organisations. 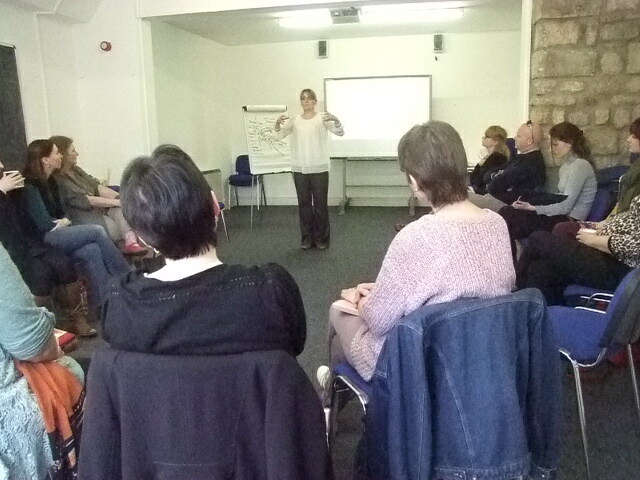 The practical workforce development aspects of the day really made the training session stand out.